Coach Cynthia gives us the details of what her and Coach Preethi learned at the first ever ESPNW Women + Sports Summit. Coach Preethi and I had the once-in-a-lifetime opportunity to attend the espnW: Women + Sports Chicago event. To say that we enjoyed ourselves would be a gross understatement…I don’t think anyone else in that room of 300+ women was “fangirling” as hard and as shamelessly as we were. We were surrounded all day by inspirational women of all ages who have paved the way in sports for women around the country, and we are beyond excited to share the stories and life lessons with our UI family. The empowering day started off with a 5K run by the Lake with Julie Foudy. Julie, for those of you who may not know, is a certified LEGEND in the soccer world. I remember being a little 9-year-old tomboy and watching her, alongside other USWNT legends like Mia Hamm and Brandi Chastain, take home the World Cup in 1999. So Julie, along with being a part of the national team, has gone on to create the Julie Foudy Sports Leadership Academy and is an ESPN analyst and reporter. The morning of the run Julie was immediately warm, welcoming, and charming beyond belief to us all. She made it a point to introduce herself to “all the brave souls” who came out for the run. (insert twitter photo/link). And now Preethi and I can say that we ran with a 2-time World-Cup champion, Olympic gold-medalist, Julie Foudy. The espnW event itself was held at Morgan Manufacturing, the home of the Urban Initiatives Soccer Ball. 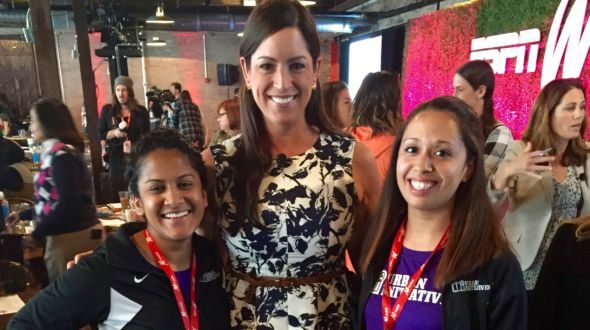 Sarah Spain, a friend of UI and reporter for ESPN SportsCenter, was the event host for the day, and quite the charming and hilarious host at that. The discussions held throughout the day showcased standout women from the sports world, such as WNBA MVP and Chicago Sky star Elena Delle Donne, 7-time national champion Northwestern Lacrosse Coach Kelly Amonte Heller, and some awe-inspiring Olympians like Julie Johnston, Adaline Grey, Ibtihaj Muhammad, Melissa Stockwell, and Maggie Steffens. It also included women from the corporate world making an impact in sports, such as Susan Goodenow from the Bulls and Morgan Flatley from Gatorade. Each woman who took the stage shared her successes in sports as well as obstacles she’s had to overcome, and also changes she’d like to see for women in sports. I would love to get these women out to our programs so that they may inspire our young female participants as much as they inspired Preethi and me! One revolving theme I saw in all the athletes and women we spoke with–when asked how it was that they were able to achieve such greatness within their sport or career– was the importance they placed on having a relentless attitude and a committed network of supporters. I wonder how we can instill that attitude and provide that network to all the amazing women in our community, and on a smaller scale, in our UI Family? I know we are fortunate that we have some tremendous female role-models out in the field every day for our UI programs, and I hope that we, as a Chicago community, also make a conscious effort to focus and champion for our young women who may someday be the next Carli Lloyd, Serena Williams, or Ronda Rousey. I hope that we inspire both our female and male participants to lead the charge in equality not just in sports but in other aspects of their lives as well, for the benefit of our community as a whole.